The Soundelux U195 is a cardioid-only FET condenser with a large-diaphragm K67-style capsule. The “Elux 195” was discontinued with the demise of the Soundelux name, but the mic’s designer, David Bock, has reintroduced an identical microphone under the name Bock 195. The following description applies to that mic as well; click through to the Bock 195 page for additional information about the 195’s circuit and design intent. The U195 has a unique tone control switch labeled “Fat/Norm.” The Norm position provides an extended flat response with slightly elevated high end typical of FET condensers, while Fat creates a low end boost between 10Hz and 400Hz. The U195 also provides a variable pad (0dB to -30dB) and rumble filter (-10dB at 30 Hz) — further enhancing the mic’s versatility. 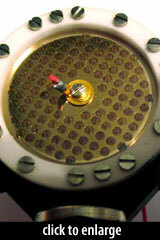 The microphone capsule is a K67-style design with dual 1-inch gold-sputtered diaphragm. 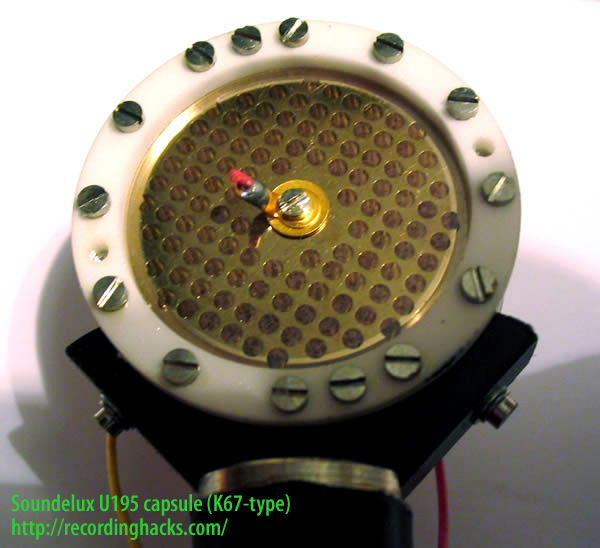 Unlike some fixed-cardioid mics, the U195 ships with a dual-membrane capsule; the termination wire on the rear diaphragm is not connected to the circuit. In the event that the front diaphragm is damaged, the capsule can be reversed, essentially doubling the useful life of the microphone. The electronics package has no surface mount components. Instead, it incorporates Roderstein resistors, low ESR elecrolytic capacitors, polypropylene coupling capacitors and a unique FET circuit exhibiting remarkable low noise, low capacitance, and extended high frequency characteristics. Ample headroom throughout prevents the FET “fizzle” plaguing other designs, while a massive output transformer maintains coherent signal integrity across the full audio bandwidth. The U195 was originally released at a MSRP of $995. The Soundelux U195 is also known as: Elux195.